I think it’s in the eyes. lars and goldmax like this. Last edited by Call me Al; 03-05-2019 at 11:44 AM. have you ever thought about painting your garage? I got some concrete paint and painted my garage walls white last summer. Really transformed it and enjoyed working in there more. Matt Leavitt, lpspeedster, lars and 1 others like this. 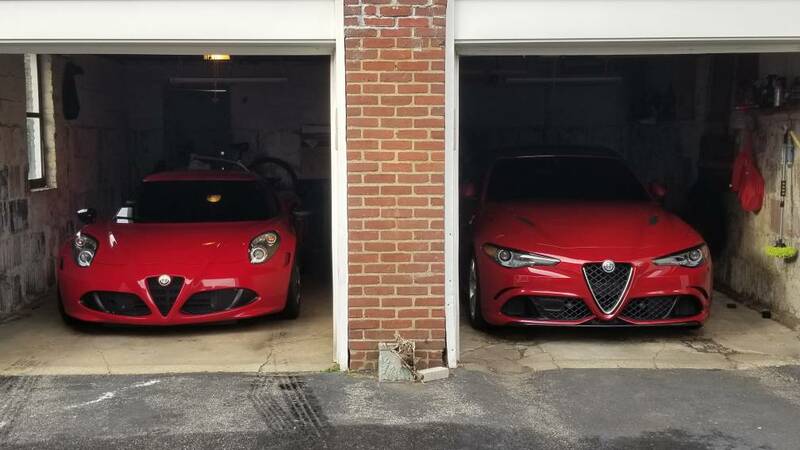 We have a 2015 LE 4C, an early production '17 QV and an '18 Stelvio ti. All are completely different drives, but they are all best in class, IMHO. The 4C had some issues when new, which Alfa sorted out. About 20,000 miles now, a few tracks days, fairly spirited road driving and most of the mileage with the Pogea Stage 1 Plus tune/exhaust installed. and its been perfect and never a code or problem since Alfa sorted the initial issues out at around 3,000-4,000 miles. The QV has about 17,000 miles on her, no issues at all except for a quirky nav system when brand new (sorted by the dealer first day with flash update), a squeaky CF driver's seat (replaced by the dealer at about 6,000 miles), and a poorly adjusted hood release (adjusted by the dealer). Its my daily driver. I'm on my second set of P Zeros, which are pretty dicey (kinda' like hockey pucks) below about 55 degrees. Will put Michelin 4S's on for the next set. The Stelvio has about 14,000 miles now, and has been flawless. That's my wife's DD, except when she decides she wants to play in the QV for the day. Under these circumstances, I am forced to drive the 4C. Have both. Can't drive them enough. Great compliment to each other. I own an LE 4c, I had the QV for a day about a year ago..and after being spoilt by the speed, noise, attitude, admiration of the 4c. I found the QV sorry but a little boring ..I understand they are two completely different cars etc etc. I was expecting alot more..I found myself constantly on the rev limiter without notice in 1st and 2nd..due to it being (a good thing) super smooth and a little too quite (not good). We actually lined up my Friends 4c and the Giulia in a Short sprint. Me being in the 4c..I actually won the sprint up to approx 13oKm's. I have mixed feeling about it and is it really a better car? would I buy one? I'd be happy with the Veloce model, save big money and have my little weapon for the weekend. If the GTV comes out well that may be a different story. Its a Beautiful car..to me the 4c offers much much more! I don't think you can be spoiled by the speed of the 4C compared to the QV. The noise yes, which makes the 4C sound faster than it is. The QV is much quieter but I love the sound as you shift. I just know I have to shift quickly the first couple of gears as the car is fast. I can't compare the 4C to the QV on speed - the QV is just so fast. I drove the QV and the base Giulia the same day, and I did not even consider the base Giulia. This was a second car that I did not need so it was the QV or nothing. The Base Giulia has 200hp and the Qv 503 hp there's a difference of 300hp of course there's no comparison. I would buy the Qv too. We're talking about the 4c and the Qv. Dollar for Dollar I believe 4c trumps it...in Looks, character, rarity, Ok not outright speed but we don't need to do 300km/h, presence, attitude. etc. I'll wait for the coupe..that'll be a game changer and worth the Extra Dollars. This is probably a stupid question, but why do you call it QV? I can't figure it out. Because that’s what the Italians decided to call it that rather than spell out Quadrifoglio all of the time. It is also called Quadrifoglio Verde which translates to four leaf clover that is green, or “QV” for short. It’s also sometimes called Quattro Verde which also comes up as QV for short. Every Alfista should read about the racing history of the word Quadrifoglio and the racing badge it represents as it’s quite interesting. RKBerta, brightoncorgi and Superfluous like this.